One of the things that has always puzzled me about Byzantine manuscripts and ivory caskets is their depiction of a chest strap and two shoulder straps over the lamellar armour. In the Osprey books, this is dealt with in a very unsatisfactory manner, with the bands being shown as leather but no attempt to show any means of fastening, or even an attempt to explain them. In fact, the entire treatment of the lamellar is generally misleading in the Osprey illustrations; it is, for instance, impossible to continue the torso plates straight up into the arms (unless you wish to spend your life with your life with your arms outstretched horizontally!). Consider also the methods of fastening the armour: in only one illustration are the buckles shown at the front, which is practical, though they run the risk of being cut by a slashing blow. It is only practical that each man should be able to put on his own armour, so tell me how all these people do up the fastenings which appear to be in the middle of their backs? The best solution is to have the lamellar fastenings up the side, and as the left side is covered by the shield it would seem to be the obvious choice. As far as I know, no complete set of lamellar survives, and as such details would have been painted on to complete carvings they too have not survived, but my interpretations are at least based on field trials of reconstructed lamellar, namely Ketil's 600 plate example. So, returning to the original point about the strapping arrangements, the first thing to be borne in mind is that most Byzantine armour was issue kit, held in central armouries and issued to units, rather than personalised items. So what happens when I, with my mere 36" chest, get lumbered with some designed for weight-trainers like Ketil with their 44" chests? Well, what you don't do is just lace it up and rattle around inside it: it's very uncomfortable after a short time, and rubs away at your neck. The solution is not to tie up the armour, but to overlap it. This is secured in place by a broad leather band around the chest, tied together at the ends. Of course, any strenuous exertion, such as fighting, results in heavy breathing, and as a result the band will inevitably slip down around your waist, where it is no good to anyone. This is where the shoulder straps come in. Secured to the main band below each shoulder blade, they pass over the shoulder and are tied or buckled onto the chest band, again at the font. Simple, isn't it. Like the Croix du Nord Norman group from Regia Anglorum and their interpretation of chest squares from the Bayeux Tapestry, it is only when we, as a living history society, attempt a reconstruction using the information available in a practical form that we can provide valid answers to these questions. Having got the latest Clamavi, I saw that there was an article on lamellar armour, something that I'm quite interested in, having already built a set (not out of steel alas) and encountered many problems particularly with source material. I agree that The Osprey book is remarkably hazy on the lamellar armour issue, showing a possible threading pattern for the plates but not giving any word upon the direction of the overlap laterally around the body. It gives no indication whether the overlap is all one way, if the direction alternates between rows of if the overlap changes with the part of the body covered. Indeed this small, but useful, piece of information enables you to see that there are only two possible places for the armour to lace up, under each arm. The overlap precludes the front or back for strength reasons. Concerning the arm pieces, certainly the Osprey book is again very hazy on the actual colour plates, however the period illustrations suggest that the arm pieces (where used) may have been separate pieces of armour, but put on before the torso piece and held probably by straps. The join was then protected by the hanging strips called Pteruges. The breast/shoulder type favoured by the infantry.... 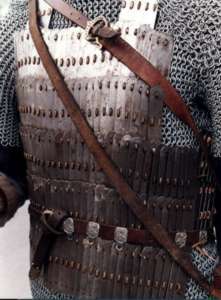 The band in the illustrations of the period does not limit itself to appearing on lamellar armour appearing on quilted and chainmail as well. The sash-type favoured by the cavalry and commanders, tied around the upper chest. The sash-type is seen to be tied at the front and may properly served for identification purposes, similar to chest plumes. It can be noted that most illustrations of the warrior saints of this period show them wearing these sashes. The widespread use of breast/shoulder band amongst infantry, suggests that it had some tactical advantage. Considering that the infantry favoured the long lances (twelve feet long) and large round shields, it suggests shield wall tactics were used. The bands could therefore be used by the second row of the wall to grip and reinforce the front row in situations where a single person thickness wall would not hold, a double or multiple person wall would stand up. If pig-snout tactics were used the harness again serves to strengthen the formation. Last updated 28 March, 2005. Article by Article by Andy Nicholson and Alaric of Lothian 1990.